You may be wondering about a post that was on my blog on Friday wherein I made Melissa Clark’s Sticky Cranberry Gingerbread live on webcam (using LiveStream) and then interviewed Melissa Clark on my cellphone afterwards. Many of you attended, though you missed the ending when the cake came out of the oven because LiveStream cut out. Not only that, but LiveStream didn’t archive the video (even though I hit “record”) so I had to take the post down because there was nothing left to see. Luckily, though, there’s this picture of the finished product and my profound ability to capture its essence in words. Think Christmas. Think Thanksgiving (at least, the cranberry sauce). Spicy, fragrant, gingery, wintery, this gingerbread is remarkable not only for the way it makes your whole apartment smell like the holidays, it’s also remarkable because the texture is just dry enough to lift up a piece with your hands, but wet enough to be incredibly, notably moist. I suppose that’s why “sticky” is in the title. It’s that kind of gingerbread. So here’s the recipe and if you love it as much as I do, you’ll want to run out and buy Melissa’s latest book, “Cook This Now,” in which the recipe appears. Not only is there the gingerbread, but there’s a roast chicken recipe that Melissa described during our interview that sounds really incredible: you put chickpeas, carrots and a sliced lemon under the chicken so it catches all the drippings. Doesn’t that sound pretty brilliant? I’ll be trying that one next. Summary: A sticky, Christmasy gingerbread from Melissa Clark’s latest book. Preheat the oven to 350 F and line a 9-inch-square baking pan with parchment. In a small, heavy-bottomed saucepan, stir together the cranberries, granulated sugar, and 1 tablespoon water. Stir the cranberries over medium heat until the sugar is completely dissolved and the cranberries form a sauce that is syrupy and bubbling thickly, about 10 minutes. Aim to have about half of the cranberries broken down, with the remainder more or less whole. In a separate saucepan, stir together the butter, brown sugar, milk, molasses, and golden syrup over medium heat. Bring it to just barely a simmer and then remove it from the heat. Do not let it come to a boil, or the mixture might curdle. In a large bowl, sift together the flour, ginger, cinnamon, baking powder, salt, baking soda, and black pepper. Beat in the butter-molasses mixture and then beat in the eggs. Stir in the ginger. Scrape the batter into the pan. 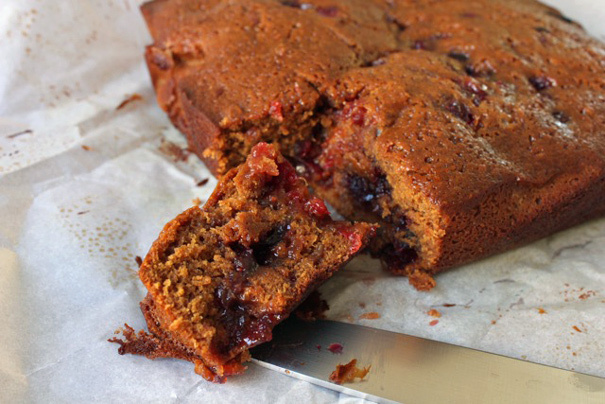 Drop fat dollops of cranberry sauce onto the surface of the cake batter. Drag a long, slender knife through the batter in a swirly design, as if you are marbling a cake. Transfer the cake to the oven and bake until the top is firm and a toothpick inserted in the center comes out clean, about 50 minutes. Transfer the pan to a wire baking rack and let the cake cool completely before eating it.